You know the feeling...mid-afternoon strikes and all of a sudden you crave something a snack. A lot of the time, I crave salty things most likely because I have not had enough water to drink. All of these things are healthy, natural and easy snacks to pick up at the grocery store and pre-package if you take snacks to work. My favorite peanut butter has very few ingredients, honey being one of them. It's great with a piece of fruit. Nut Thins are awesome for something with a crunch and the ranch packs a flavorful punch. The kale chips were a surprise to me. I love the nacho flavor and didn't expect to. It's a great afternoon snack and makes you feel full until dinner. If I'm working out, I love Luna bars for some protein to fuel the workout. Occasionally I will drink some kombucha with a snack and the verbena rose is a nice mild flavor that masks the sourness that kombucha naturally has. 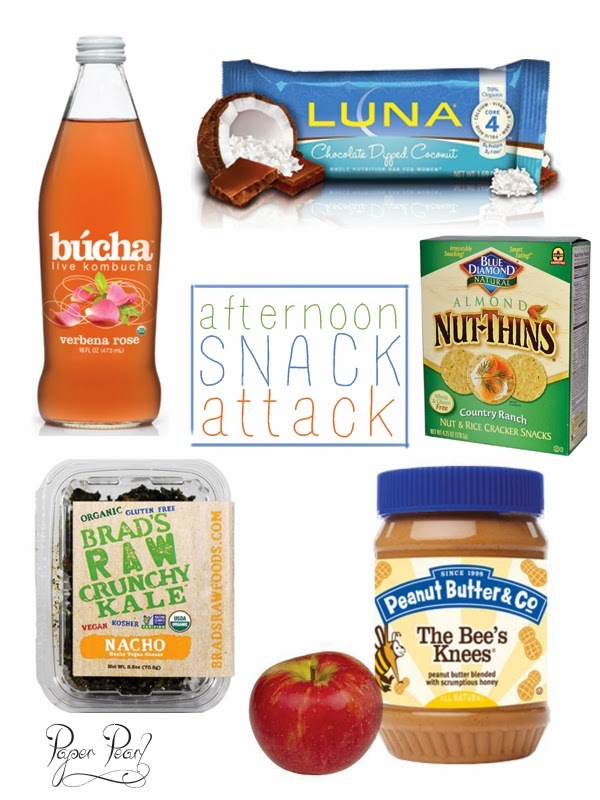 All of these things can easily be found at Kroger and will crave that afternoon crash.